Many of these symptoms can be managed with moisturizing lotions as well as protecting the skin to prevent infections. The acne appearing rash is the most disturbing skin symptoms for the majority of people who use these medications. 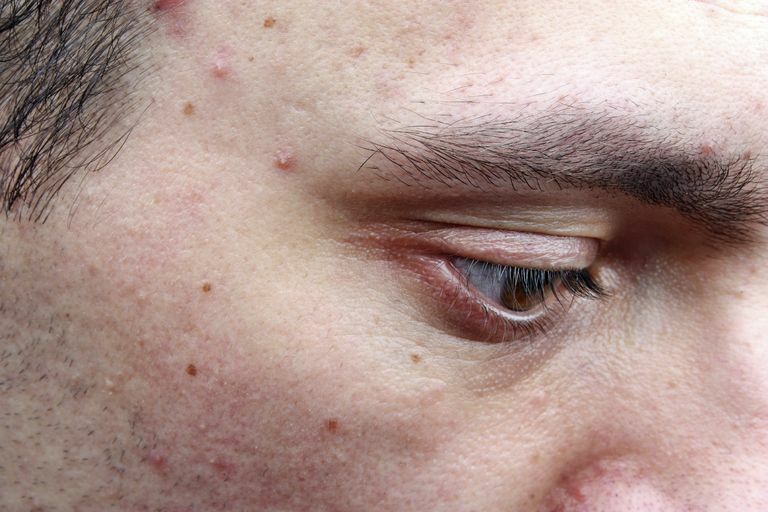 Acne-like sores (lesions that look like whiteheads) closely resemble the acne often seen in teenagers. It frequently involves the face, the area behind the ears, the neck, the upper trunk in a V-shaped pattern, and the scalp. Less commonly it affects the lower back, abdomen, buttocks, and upper and lower extremities. The rash does not occur on the palms of the hands or the feet. Dermatology terminology can be confusing if you read information about this rash, but a few simple definitions can help. A papule simply means a bump on the skin. A pustule means a bump that looks pus-filled or is draining. The term follicular simply means the skin sores are near or in a hair follicle. The number of people who experience an acne-type rash can vary with the different types of EGFR inhibitors. With Tarceva (erlotinib), most people will have this rash to some degree. Skin problems on epidermal growth factor receptor inhibitors can significantly impact both physical and emotional quality of life for people taking these medications. One survey found that these side effects affected the physical, functional, emotional, and social well-being of people taking these drugs. The most common complaints were about the physical symptoms, including pain, a burning sensation, and sensitivity. When Does the Rash Occur and How Long Does It Last? Skin rashes on EGFR inhibitors usually begin 1 week to 2 weeks after treatment is started, are at their worst 2 weeks to 3 weeks after treatment has begun, and may gradually resolve or disappear completely over the next 2 months to 3 months. Knowing that the rash tends to improve over time has helped some people cope with the symptoms. Studies do suggest that people who develop a rash on the drug have a better response rate and better overall survival. Because of this, and because the drug is often taken for an extended period of time, it is very important to be proactive in treating symptoms of the rash. Skin problems related to other cancer treatments such as chemotherapy and radiation therapy may be present along with those from EGFR inhibitors and should be addressed carefully by your oncologist. Mild: A mild Tarceva is defined as one that has no ulceration (open areas), weeping (drainage), or infection. People usually have only mild symptoms and it does not interfere with normal life activities. Moderate: A moderate Tarceva rash may be localized or generalized. There is usually no ulceration, weeping, or infection. Mild to moderate symptoms of itching and tenderness may be present, but there is only minimal interference with life activities. Severe: A severe rash is often generalized (covering the face, upper chest, and upper back) and is usually associated with severe symptoms of itching and tenderness. It significantly impacts the quality of life. There can be ulceration (open sores), weeping (drainage), and signs of a secondary skin infection such as redness, yellow or green discharge, and fever. How your rash will be treated will depend upon the severity of the rash, as well as your personal preferences. Even though the rash resembles acne, it is not an acne rash, and will not respond to most acne treatments. Preventive strategies include keeping the skin clean, avoiding sunburns, and using moisturizers to keep your skin hydrated. The best bet for avoiding sunburns is to avoid direct sunlight during midday, and to use protective clothing. Sunscreens, especially sunblocks can make EGFR inhibitor rashes worse. Occluding the rash with vaseline products can likewise exacerbate hair follicle inflammation and worsen the rash. It's important to note that treatments for one symptom related to EGFR inhibitors may worsen another symptom and vise versa. For example, moisturizers may help with dryness and itching but worsen the acne type rash. Treatment options for moderate or severe rashes may include treating the rash alone, treating any secondary infections that occur, or changing the dosage of the medication. If symptoms include a red rash alone without signs of infection, It may be treated topically or orally. Topical treatments: Topical steroids, 1 percent hydrocortisone form mild to moderate rashes, or 2.5 percent hydrocortisone for severe, is commonly used. Topical antibiotics (such as topical clindamycin) may also be used (with or without hydrocortisone). Studies are looking at the use of vitamin K cream, as well as epidermal growth factor ointment, which both have shown promise in clinical trials. It's important to again note that though the rash resembles acne, it is not, and most treatments for acne will not help with the rash. Oral treatments: If topical treatments are not sufficient, oral therapies with different tetracycline category antibiotics may be used. Studies are also looking at the use of oral treatments, such as oral minocycline as a prophylactic treatment; started before a rash occurs. When a rash due to an EGFR inhibitor such as Tarceva is complicated by a secondary bacterial infection, there is not only redness but usually signs of infection such as whiteheads. When this is the case, treatment should include both oral antibiotics (tetracyclines) plus topical clindamycin gel. Roughly 10 percent of people develop a rash which requires a medication change. As an example, with Tarceva, the "usual" dosage is 150 mg daily. An oncologist may consider lowering this dose to 100 mg or even 50 mg daily. This can be frightening, especially if the medication is working well for you. It may help to be aware that even very low doses of Tarceva, as low as 25 mg daily, have been effective in treating some people with lung cancer. Rashes from EGFR inhibitors can be uncomfortable and unsightly (who wants to feel like a teenager with acne again?). Fortunately, there are treatments that can help with the rash, and sometimes just knowing that the rash could be a positive sign that the medication is working, can reduce some of the stress of the rash. If your rash is bothersome, make sure to talk to your oncologist. Some people hesitate to "complain" as a rash is not as life-threatening as many potential side effects of treatment. Yet, quality of life is extremely important as you cope with cancer. Califano, R., Tariq, N., Compton, S. et al. Expert Consensus on the Management of Adverse Events from EGFR Tyrosine Kinase Inhibitors in the UK. Drugs. 2015. 75(12):1335-48. Fabbrocini, G., Panariello, L., Caro, G., and S. Cacciapuoti. Acneiform Rash Induced by EGFR Inhibitors: Review of the Literature and New Insights. Skin Appendage Disorders. 2015. 1:31-37. Kiyohara, Y., Yamazaki, N., and A. Kishi. Erlotinib-related skin toxicities: treatment strategies in patients with metastatic non-small cell lung cancer. Journal of the American Academy of Dermatology. 2013. 69(3):463-72. Passaro, A., Di Maio, M., Del Signor, E. et al. Management of Non-Hematologic Toxicities Associated with Different EGFR-TKIs in Advanced NSCLC: A Comparison Analysis. Clinical Lung Cancer. 2014. 15(4):307-12. Shinohara, A. et al. Efficacy of prophylactic minocycline treatment for skin toxicities induced by erlotinib plus gemcitabine in patients with advanced pancreatic cancer: a retrospective study. American Journal of Clinical Dermatology. 2015. 16(3):221-9. Szejiniuk, W., McCullock, T., and O. Roe. Effective ultra-low doses of erlotinib in patients with EGFR sensitising mutation. BMJ Case Reports. 2014. Doi: 10.1136/bcr-2014-204809.